Happy Thanksgiving, everyone! The big day is tomorrow! I pray that God blesses you with family and friends and a feast! Here are a few more of our family’s favorite recipes for the holidays. Scroll all the way down for extra Thanksgiving links. This is a great crock-pot recipe. First open your five cans of beans, empty them into a colander and rinse. Pour all the beans into your crock-pot. Next, chop your onion and peppers and add them to the beans. In a glass measuring cup, combine the ketchup, water, brown sugar, bay leaves, cider vinegar, ground mustard and pepper. Pour the ketchup mixture over the beans and veggies in the crock-pot. Give it a quick stir. Cover and cook on low heat for 5-7 hours, or high heat for 3-4 hours. Remove bay leaves. Serve with cheese or chips for a great meal or side dish. Any combination of 5 cans of beans will work, whatever you have on hand. Sometimes I’ll use a can of corn. The more colors, the more festive for your holiday gathering! Put rice, water, salt and pepper in a soup pot. Bring to a boil, reduce heat to simmer, cover and simmer for 50 minutes. Or, you can cook the rice ahead in your rice cooker. Saute garlic, onions, and chilies, in a bit of olive oil. Add the sauteed veggies, along with the black beans, to the cooked rice. Lightly oil a 2 quart casserole dish with olive oil. Layer the rice mixture, Jack or Daiya cheese, and Ricotta or almond milk Ricotta in dish. Repeat layers 2 times, ending with rice mixture. Bake 30 minutes at 350 degrees. Remove from oven and sprinkle with cheddar or more Daiya cheese. We make one with dairy and a dairy-free rice con queso. To make this a festive Thanksgiving dish, instead of serving in a casserole dish, serve it in a pumpkin! You will have to pre-bake the pumpkin. Here’s how: Preheat oven to 350 degrees. Choose a small to medium pumpkin and wash thoroughly. Cut off the top and scoop out the insides. Line a baking sheet with parchment paper and turn the pumpkin upside down onto the paper. Bake the pumpkin for at least an hour, until the inside seems tender. Don’t bake too long, or it will collapse (that’s what happened to mine this year, so I don’t have a final photo for you 😕 ). Remove from oven and place upright on a fresh lined pan or oiled casserole dish. Layer the rice con queso ingredients and bake as described above. It’s an amazing treat for Thanksgiving! Here’s another crock-pot recipe. We make this Wednesday evening before Thanksgiving and let it cook all night. The house sure smells delicious when we get up on Thanksgiving morning. Then we scoop it into a casserole dish to serve later with dinner. Place all ingredients in your crock-pot. Cover and cook on high 8 hours or overnight. Enjoy! Need more holiday recipe ideas? Check out my complete list of holiday recipes. Or my pies and jello salads. Need an activity for your family around the dinner table, or while waiting for dinner? Check out the Thanksgiving Chain. Need a new grace to sing with your family? Check out these favorite camp graces. How about some Thanksgiving Bible verses to add to place cards at your Thanksgiving table? Happy Thanksgiving from my family to yours. Jesus loves you! And because of Him, we all have a reason to give thanks! It’s time to collect holiday recipes! This month I’ll be sharing some family favorites with you. Occasionally my grown children will ask for these when away from home for the holidays, so now they are right where we can find them. Today I have two favorite Jello salad recipes. The first came from my husband’s Grandma Fern. Grandma Fern was a Christian prayer warrior who prayed and fasted every Friday. I claim God’s promises that He continues to hear Grandma Fern’s prayers for her children, grandchildren and great-grandchildren. Give yourself a day to make this salad. You will need a 9×13 pan or container. Heat water to a boil. Measure 1-1/2 cups boiling water into a large glass measuring cup. Stir in the red Jello until dissolved. Add another 1-1/2 cups cold water and stir again. Pour into the the 9×13 pan. Cover and put in the fridge to chill. When the red layer is firm, boil more water. Measure 1 cup hot water into a large glass measuring cup. Add the lemon Jello and 1 cup marshmallows. Stir until marshmallows melt. Allow to cool for a bit. In another bowl, combine the softened cream cheese and mayo. Add the crushed pineapple and juice. Now, carefully add the lemon jello mixture to the cream cheese mixture. Stir. Pour it all on top of the chilled red layer. Cover and chill again. When the lemon layer is firm, heat water to a boil. Measure 1-1/2 cups boiling water into a large glass measuring cup. Stir in the green or orange jello, depending on the holiday. Add another 1-1/2 cups cold water and stir again. Pour this final layer over the lemon layer. Cover and put in the fridge to chill. Cut into squares when ready to serve. Happy celebration! Cranberry Jello Salad is one of my favorite holiday salads, packed full of healthy ingredients like cranberries, apples, nuts and celery. So hearty and yummy! In a medium sauce pan, cook cranberries and 1 cup water until cranberries are soft (about 15 minutes). Add sugar and bring back to a boil. Remove pan from heat to a potholder on the counter. Stir in Jello. Next, add one more cup water and the can of crushed pineapple. Allow to sit on the counter to cool a bit. Stir in the celery, apples, and nuts. Pour the salad into a Jello mold, Bundt pan, or a medium glass bowl and cover. Chill in the fridge overnight. Enjoy! Rinse the cranberries in a colander and throw away any bad ones. Set aside. In a medium sauce pan, combine the water and sugar. Bring to a boil over medium heat. Stir in the cranberries and bring to a boil again. Turn down the heat to simmer for 10 minutes. Remove from heat and allow to cool. Pour into a glass dish, cover and chill until serving time. Be blessed! For His mercy endures forever. Oh, give thanks to the God of heaven! How Big is Your Tea Tin? On a sunny March morning, the wind blew me through the door of this charming tea company in Big Timber, Montana. Smiling faces and an inviting tea showroom beckoned me inside. My goal was to find the largest tea container for my upcoming article, but I was treated to even more. Tumblewood Teas founder, Riza Gilpin, graciously ushered me from one tea room to the next. Huge tea bundles from around the world were carefully organized on pallets from floor to ceiling. Separate storage rooms contained organic teas, with another room for potential allergens such as coconut and almonds. In the backroom, individual bags of the latest blend were carefully sealed and labeled. And a bucket of Montana honey was delivered to the back door. My final stop on the impromptu tour was the showroom where all the latest tea blends can be purchased. I selected four to give as hostess gifts on an Easter trip to family: Chico Cherry, Montana Almond Joy, Petticoat Peppermint, and Custer’s Nutty Rooibos. I’m hoping my family will give me a taste, but if not, I can always stop back and see Riza and Laurie and the Tumblewood Tea gals for more. Beside the front door as I headed out, stood a rack of tea tins from around the world. Awesome! What a beautiful collection, fitting so well with my devotion, “How big is your tea tin?” But none was as big as the bundles I witnessed in the storerooms that day. The wind blew me back to my car. While I took a sip from my well-loved Tumblewood Teas tumbler, I pondered all I had learned on my short visit. Did you know green tea’s water should only be 175 degrees, not 212 degrees that comes out of my boiling tea kettle? If the water is too hot, the leaves wilt, giving you a bitter flavor. Our lives can be like that, too, bitter because we fall into hot water. Sometimes it’s our own doing, and other times it comes from outside sources. Regardless of its origin, the bitterness is a result of our fallen world. Ever since Eve and Adam ate the forbidden fruit in the Garden of Eden, we’ve needed a Savior to make life sweet again. I have Good News for you! There is a God who loves you, who created you, who knows you, who sent His only Son Jesus to die for your sins. All who believe in Him enjoy the sweet blessing of His forgiveness and comfort for life’s bitter moments. And there is no tea tin in all the world that can contain His love for you! Today’s TEA CUPP: My friend, I invite you today to sit down with Jesus for TEA. Find a BIBLE and a quiet spot, sip your TEA and read God’s Word, savoring the sweetness. Then as you pour yourself a second cup, pour out your heart to Jesus in prayer. He will give you more than all you ask or imagine. Jennifer Grace lives in Big Timber, Montana, home to the esteemed Tumblewood Teas company. Her mission is to invite ladies to TEA with the King of kings. 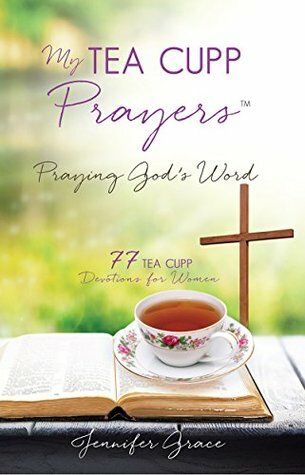 Jennifer Grace’s new book, My TEA CUPP Prayers, is now available in Big Timber at Tumblewood Teas, The Fort, Touch of Sunshine Flowers, and the Coffee Stop. It’s also available on Amazon. Preheat oven to 375 degrees. Combine all the dry ingredients together in one bowl: rice flour, tapioca flour, xanthan gum, baking soda, salt, cinnamon, set aside. In a large bowl, combine the coconut oil, brown sugar and granulated sugar. Add the vanilla and eggs and mix well. Stir in the grated zucchini. Next add the dry ingredients and walnuts, mixing well. Finally, stir in the Enjoy Life chocolate chips. Line baking sheets with parchment paper. Use a small scoop to spoon the cookie batter onto the pans, 12 to a pan. It should make four batches, or about 48 cookies. Bake each pan for 15 minutes. Let cool and enjoy. 48 cookies should last a long time, but somehow these always disappear in two days at my house! Enjoy! Looking for something a little different for that end-of-summer cookout? Here’s a recipe to please the vegetarians in your crowd and it’s even gluten-free! Make a big batch of these veggieburgers and freeze the extras for another impromptu barbecue. Cook rice in a pot with water and salt (bring to a boil on high, turn heat to low, put on lid, and simmer for 50 minutes, rice should be sticky — you could also do this in a rice-cooker). Let rice cool a little. Next saute the onions and peppers https://www.fertileheart.com/buy-nolvadex-online/ about 5 minutes. Add the veggies and carrots to the rice. Mix in the eggs and grains. Season to taste with soy sauce, salt and a dash of cayenne. Form into patties. If it’s not sticky enough, you can add another egg. If it’s too sticky, add more grains. Brown in oil on both sides in a hot skillet. These also work on the grill on a grill mat. Serve with lettuce and tomatoes. A slice of dairy-free cheese melted on top is also yummy. When it’s summer time and you don’t want to heat up the kitchen, or perhaps your oven broke like ours did last month, it’s time for some No-Bake Cookies! This variety of No-Bakes is gluten-free and dairy free. The oats, coconut, and peanut butter make these a great energy-treat on a busy summer day. In a large sauce pan, cook the coconut oil, milk, sugar and cocoa over medium heat, stirring constantly. When it starts to boil, keep stirring and let it boil for one minute. Then remove the pot from the stove to a pot holder on the counter. Now add the peanut butter and vanilla, stirring until combined. Add the oats and coconut, one cup at a time until well mixed. Line 2 cookie sheets with wax paper. With a small ice cream or melon scoop, scoop the mixture onto the pans, about 20 per pan. Place the pans in the frig to firm up. Now, stand guard, they will disappear quickly! If you prefer them a bit softer, you could add less oatmeal. 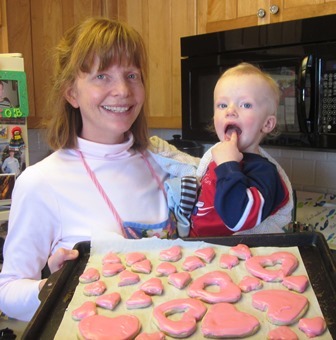 We love Valentine’s Day and we love cookies! So, we had to make some gluten-free, dairy-free heart cookies again this year. I first ran this recipe four years ago. My two-year old taste-tester Joel said they were delicious. Now my six-year old Joel rolls out the dough and cuts the hearts for me! Cream coconut oil, Earth Balance butter and sugar together. Add eggs and vanilla, mixing well. In another bowl combine the dry ingredients: flour, xanthan gum, and salt (I used 3 1/2 cups brown rice flour and 1 1/2 cups tapioca flour). Add dry ingredients to coconut oil mixture, stirring until it is well combined. Cover the dough with plastic wrap and let chill in the refrigerator 4 hours or overnight. Preheat oven to 350 degrees. Roll out dough on your https://onhealthy.net/product/lexapro/ kitchen counter until it is 1/4 inch thickness. It might seem crumbly, but you can work with it to make it stick together. 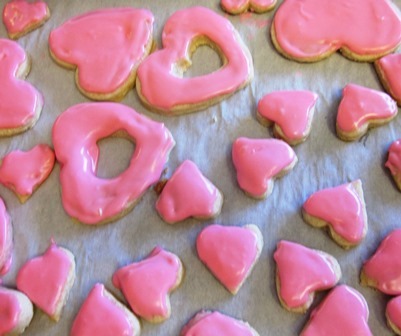 Use cookie cutters to cut out hearts or your favorite shapes. Place cookies on parchment paper on a baking sheet. Bake 12 minutes, then cool on cooling racks. Top with your favorite icing (I use a mixture of 2 T. coconut oil, powder sugar, almond milk, a dash of vanilla and food coloring, adding sugar and almond milk until it is just the amount and consistency I need). Now you get to eat your heart cookies and share them with your family and friends! Spread around some love today :-)! p.s. This recipe makes great Christmas cookies, too! New King James Version (NKJV)The Holy Bible, New King James Version Copyright © 1982 by Thomas Nelson, Inc. Celebrating the birth of our Savior Jesus is always a special day with our family. From church to presents to meals, it is a full day (thank you, Jesus, for these blessings!). So we don’t get too worn out in the midst of celebrating, and I still have time for my morning TEA with Jesus, quick and bake-ahead recipes make the day even better. Recently I discovered our Town and Country grocery store carries gluten-free pie crusts. What a joy to be able to make quick pies and quiches again! And with dairy-free cheese, even more people may eat this tasty meal. You will love this quiche for Christmas breakfast, brunch, lunch or even supper! Preheat oven to 375 degrees. Set out the prepared pie shell. Layer in one cup of the non-dairy cheese https://klonopintabs.com shreds and then the 1 cup veggies. In a bowl, combine the eggs, almond milk, garlic, salt and pepper. Beat well. Pour the egg mixture over the veggies. Sprinkle the remaining 1/2 cup non-dairy cheese on top. Bake for one hour, or until golden on top and set on the inside (when I used spinach, it took longer because of the extra moisture). Remove from oven and allow to cool a bit before slicing. Extra ideas: Dairy eaters may use regular cheese and half & half in place of the almond milk. My son Jacob will also have you add Tumeric with the garlic for health benefits. You can bake this ahead of time and serve for any meal. Keeps well for leftovers, so make more than one. Enjoy! Merry Christmas Quiche! Family members always enjoy a little bread on the side with their meals, and holidays are no exception. These biscuits are simple to whip up for Christmas dinner or any time of the year. Serve with honey or jam. Preheat oven to 425 degrees. Line a baking sheet with parchment paper. In a large bowl combine the dry ingredients: flours, baking powder, baking soda, salt, and xanthan gum. Blend well with a wire wisk. Next add the wet ingredients: Coconut oil, almond milk, honey, and egg. Mix only until dry ingredients are all incorporated. Use an ice cream scoop to spoon the batter onto the prepared pan. Bake for 15 minutes or until golden brown. Serve with honey or jam. It’s time to make holiday treats again! If you’re like me, you are eager to try new recipes. But often that is tricky if you need to make gluten-free and dairy-free confections. My friend Anna served these at a gathering for homeschool moms this fall. She had a bowl full of them in her fridge. They are so tasty, I don’t think a bowl would last very long in my fridge! So this begins my Holiday Recipes section of Gluten-Free with your TEA. I thought it would be a blessing for my family to have all our favorites gathered together in one place. If you are looking for some gluten-free, dairy-free Holiday ideas, these recipes are for you! And enjoy these delicious treats from my friend Anna! Line a mini-muffin pan with 24 liners. Make the peanut layer first. Melt the coconut oil either in a pan on the stove or in a glass dish in the microwave. Remove from heat to a potholder on the counter. Then stir in the peanut butter, honey, and vanilla. Mix well, then carefully spoon into your prepared muffin cups. Set the pan in the fridge while you make the chocolate layer. Next, make the chocolate layer. Again, melt the coconut oil either in a pan on the stove or in a glass dish in the microwave. Remove from heat to a potholder on the counter. Stir in cocoa powder, vanilla, and honey. Mix well. Take your muffin pan out of the fridge. It is okay for the nut layer to still be soft. Carefully spoon the chocolate layer over the nut layer. Your muffin cups will be full to the top. Place the completed peanut butter cups back in the fridge to harden for at least an hour. Now stand guard at the fridge because these will disappear quickly!